Cholera transmission is closely linked to inadequate environmental management. Typical at-risk areas include peri-urban slums, where basic infrastructure is not available, as well as camps for internally displaced people or refugees, where minimum requirements of clean water and sanitation are not met. 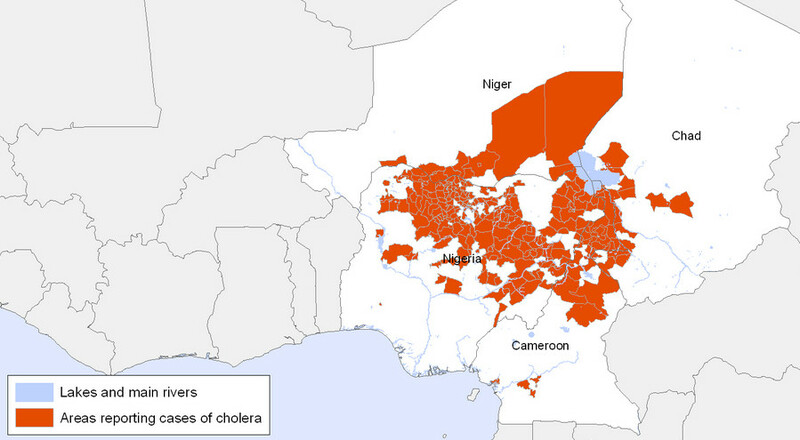 There are an estimated 3–5 million cholera cases and 100 000–120 000 deaths due to cholera every year. Up to 80% of cases can be successfully treated with oral rehydration salts. Effective control measures rely on prevention, preparedness and response. Oral cholera vaccines are considered an additional means to control cholera, but should not replace conventional control measures. Important: The oral cholera vaccine can be given at the same time as other injected vaccines. Adults and children over 6 years of age – 2 doses of oral vaccine -at 1-6-week interval. Children aged 2-6 years – 3 doses of vaccine are necessary but each dose is given with a similar 1-6-week interval. Should more than 6 weeks elapse between any doses, the primary immunisation course must be restarted. All individuals must complete the immunisation course at least 1 week prior to potential exposure. Adults and children over 6 years of age. A booster can be given 2 years after the primary course. If more than 2 years have elapsed since cholera vaccination the primary course must be repeated. Children aged 2-6 years. A booster dose is given after 6 months. According to WHO, 2005 figures, an estimated 200 000 people are infected, and 30 000 people die from yellow fever each year. 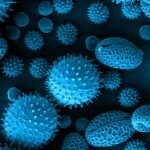 The virus is endemic in tropical regions of Africa and the Americas. Check Maps Here. The protective effect (immunity) occurs within one week in 95% of people vaccinated. You should have a yellow fever vaccination at least 10 days before your travel. 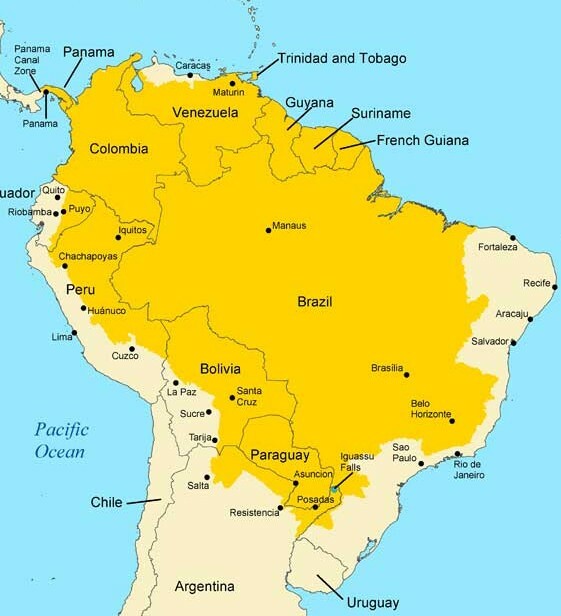 Yellow fever is a viral haemorrhagic fever – (Arbovirus of the flavivirus genus) transmitted to people by infected Aedes and Haemogogus mosquitoes. Sylvatic (or jungle) yellow fever: In Tropical Rain Forests, Yellow Fever occurs in Monkeys that are infected by wild mosquitoes. These infected monkeys pass the virus to other mosquitoes that feed on them. The infected mosquitoes bite human beings and other living animals entering the forest, resulting in new cases of yellow fever. 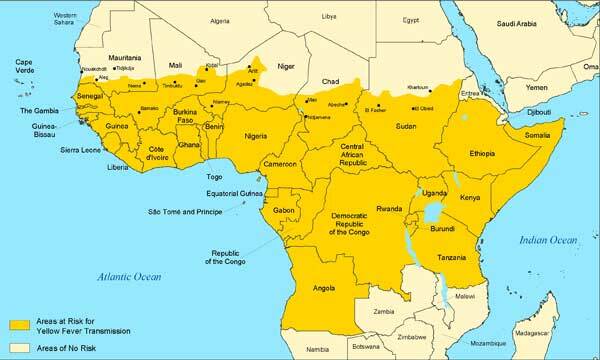 Intermediate yellow fever: In humid or semi-humid parts of Africa, small-scale epidemics occur. 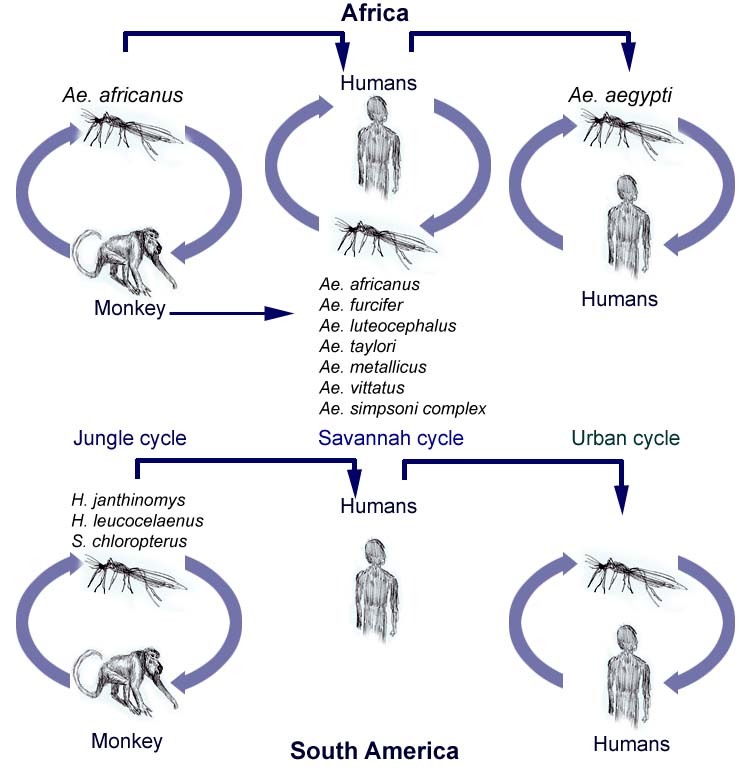 Semi-domestic mosquitoes (that breed in the wild and around households) infect both monkeys and humans. Increased contact between people and infected mosquitoes leads to transmission. Many separate villages in an area can suffer cases simultaneously. This is the most common type of outbreak in Africa. An outbreak can become a more severe epidemic if the infection is carried into an area populated with both domestic mosquitoes and unvaccinated people. Urban yellow fever: Large epidemics occur when infected people introduce the virus into densely populated areas with a high number of non-immune people and Aedes mosquitoes. Infected mosquitoes transmit the virus from person to person. 20-50% of those with severe illness will die of the disease. The “yellow” in the name is explained by the jaundice, it means yellow discoloration of eyes and skin. Doxycycline, 100mg (50 capsules = £ 80)Prophylaxis of malaria, started 1–2 days before entering endemic area and continued for 4 weeks after leaving (see notes above), adult and child over 12 years, 100 mg once daily. Following map shows the areas in Africa, where you need to have Yellow fever Vaccine, with Certificate, before you enter. 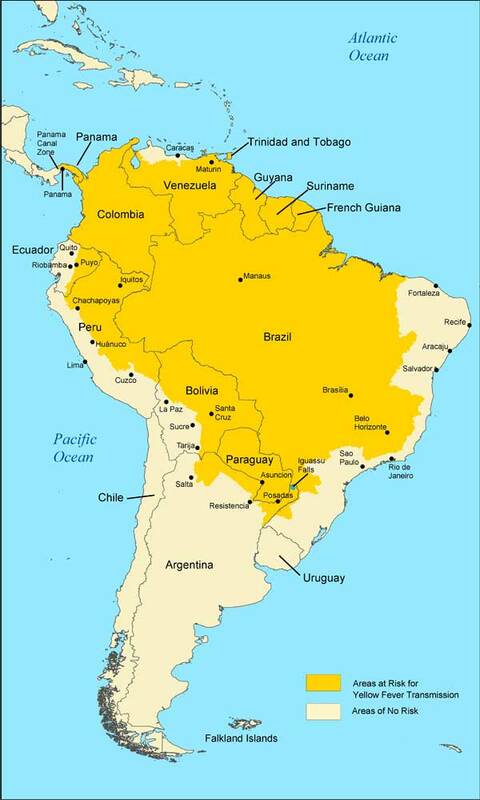 Following map shows Yellow fever risk in South America. When you have vaccines from us, we always provide you free certificates as evidence of your vaccination. Do you need a certificate for fitness to travel? 1) You may require certificates for some vaccinations to enter into a particular country/area. Such as Yellow Fever and Meningitis ACWY. In this case its free of charge at our Travel clinic. 2) Employers may request a certificate to demonstrate if you are fit for travel, proving that you have all the appropriate vaccinations required for the journey and based on medical records the person appears at present to be fit for travel. This is normally funded by the employer. For more information please read section below from BMA. 55. Are doctors required to complete fitness certificates e.g. fitness to travel or for sporting activities? GPs are increasingly being approached to complete an array of certificates for medico-legal reasons. The completion of fitness certificates raises concern because even if a thorough history, examination and any necessary investigations are carried out, doctors are still not in a position to guarantee that a patient is fit for a particular activity. The BMA discourages doctors from signing certificates which indicate that the patient will, for example, be fit for the duration of the holiday, as current fitness is not a guide to future fitness. Doctors can only report on what is written in the patient notes, and reporting on future fitness could have medico-legal consequences for the doctor. The Association would therefore advise that if certificates are provided they should include words to the effect that ’based on information available in the medical notes, the patient appears to be fit to travel’. Fitness certificates fall outside a GPs NHS Terms and Conditions and doctors can charge at their own rate for undertaking the work. Additional investigations if required will have there own additional costs associated to the requests. For example, blood tests, ECG, X-Rays or Scans. 3) If you only require a certificate as an evidence regarding your vaccines received by our clinic e.g what vaccines you have had, or how many courses and when, its free of cost.